Be a real librarian – just add books! When I was six I wanted to be either a librarian or an ‘air-hostess’ when I grew up. I’m not sure where the flight attendant ambition came from but I know why I wanted to be a librarian – my school librarian at the time was simply the most lovely, most glamorous person I had ever seen and I still remember first hearing books such as The Story about Ping and Frances the Bear during her story time. Would-be little librarians will love Little Librarian, an imaginative play library kit made for kids. 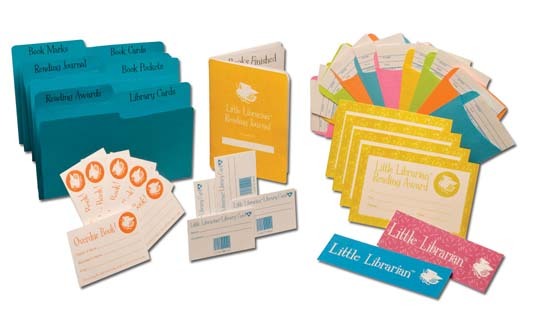 The kit includes library cards, overdue slips, book pockets and cards, file folders, reading awards, bookmarks and a reading journal. I’m quite sure that aspiring librarians will take charge of this fabulous pretend play kit but designers Mandy and Kris Miller have listed lots of terrific suggestions including starting a kids book group, creating a ‘summer reading challenge’ complete with awards and turning the family car into a mobile library! Apart from encouraging reading and fostering a love of books, Little Librarian also helps kids practice their organising and sharing skills. Little Librarian is US$19.99 and is available through Amazon but you will need to seek a reshippper as they don’t ship direct to Australia.